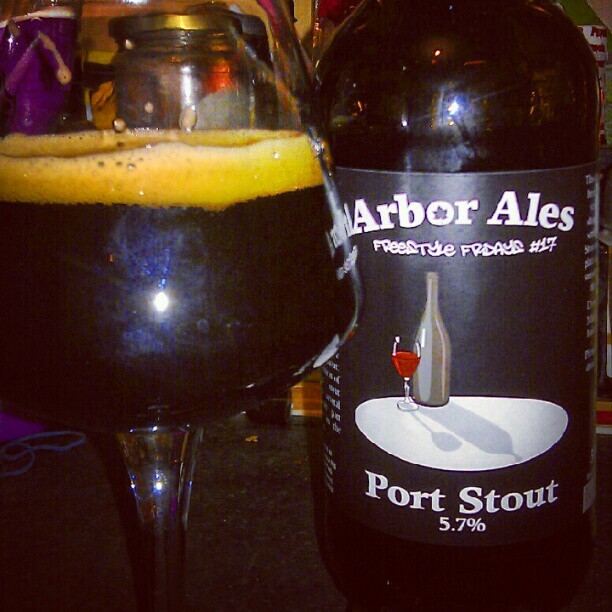 Some of you who follow my Twitter or Untappd feeds might have noticed my mini obsession with Arbor recently and last week I was lucky enough to find their Port Stout (5.7%ABV) waiting in my stash at the end of a typical cold rainy day in July. Summer pale ales, you’ve had your time. July is the month for curling up with a big glass of stout and listening to the rain beating against the window. Not warm yet? Shall we take it to the next level? How’s about some port? Now when Arbor say Port, they’re messing around with anything so fancy as barrel aging. This is a stronger version of their oyster stout with ‘several liters of ruby port added late in the fermentation.’ After a day of getting soaked in the rain this is the perfect medicine. It tastes of luxury and deserves to be enjoyed in front of a roaring fire possibly in a smoking jacket. The deep, opaque blackness invites you to inhale its dark chocolate malts and treacle-like coffee. It coats the mouth in a smooth black cloak of bitter dark chocolate and red berries with woody flavors smouldering through the finish, lifted by a slight tang of dried cranberry. I’ve never been a port drinker but Arbor now has me intrigued. All I really know so far is people drink it with cheese. I didn’t have any Stilton around but it was pretty good at bringing out the sweetness of my not-so-snooty Bavarian smoked cheese from M&S. I am now slightly concerned that beer may be leading me astray. First, Bristol Beer Factory’s Glenlivet Stout made me rush out to buy my first Whiskey. Now I think I need to try Port. Is beer the gateway drug..? Whatever it is, I like it! Sounds great! Maybe try it with a decent unpasteurised cheddar like keens? brought back from Bristle or a BV find? What spelling mistake!? *hurries to edit post before anyone else sees* Thanks for the cheese recommendation! I’m not very educated on food and drink matching but I now have a book so maybe I’ll learn something. This one was from Bitter Virtue who now have a big selection of Arbor which is handy! It’s The Brewmaster’s Table by Garrett Oliver. Only actually looked at the pictures so far but it looks good! yes, its a goodun got it before i started blogging last year. there’s a page on my blog i set up organised by beer style and some handy links at the bottom.